We promote a return to a form of Tribalism based upon local initiatives with the Shires as the backbone of the English Folk-Nation. Only through breaking free of the European Union, the New World Order and all other forms of the rampant Globalism can we return to a healthy nation and a healthy world-order. But we see the need for a European Imperium where the Free Nations of Europe and the White World would work together towards a healthy and ordered world without the problems we face today. The English Folk-Nation would have as its basis the ancient Shires, which are regions that would work on their own initiative on local issues. Once the right issues are tackled, without interference from the greed of profit and gain, then sanity will reign once more in this land. Food must be produced locally for local people (English Folk) and the simple means of life tackled locally too, thus getting rid of pollution through carting goods for hundreds or thousands of miles - goods which can be produced at a local level. Farming should return to small-scale local farming on smaller farms, reviving the healthy English hedgerows, where locally produced goods are sold and distributed to local people as far as possible. The mentality of thus providing a service to one's Folk-Community would replace the unhealthy mental attitude that seeks profit and gain from everything. Smaller farms and smaller pieces of growing land would mean the return to organic growing without the need for chemicals to get rid of pests - the hedgerows would encourage predators again. The land would be 'rotated' to minimise disease, which cannot always be done with mass-farming. The creation of crop-growing farms and livestock farms as part of a whole gives the chance to have manure from the farm to use on the farm. Factory-farming would be a thing of the past - a bad memory - and all livestock would be farmed with the welfare of all animals in mind. Crop-growing would also be done in a different manner, with the point in mind that crops - as well as animals - are living things. We oppose the use of battery hens, of the factory-farming of pigs, cows and all livestock; all animals should live as natural a life as they can be allowed to. They should be respected in life and respected in death, since they are our source of life - just as foodstuffs are our source of life. If people wish to be vegetarians, then let them, if people wish to be meat-eaters, then again they should have their choice. Both meat and veg are living beings and this has to be taken into account; if 'Meat is Murder!' then 'Veg is Murder!' for they are both living, breathing beings but at different levels - and who is to say that plants do not have a consciousness? The one great problem today is that a wedge has been driven between the farmer and the environmentalist, a wedge that makes each one unable to see the views of the other. This is where things are going nowhere, and more often than not the environmentalists are listened to even when they come up with some idiotic ideas that have nothing to do with Natural Law. In any case, since the EU decided decades ago the Britain should be a 'services nation' farming here has been under the threat of destruction. This suicidal policy could mean mass starvation in the future - not unlike that of the Russian Communists, the Chinese Communists, and Communists of every ilk who have come up with similar ideas of a 'utopian' world which hides the process of mass destruction. There are signs that some farmers are now turning their backs on the mass-produced supermarkets in favour of selling their goods locally at local farm-shops or local markets. This is a good sign that things may well change for the better. We should - as Folkish Wodenists - support as far as we can local initiative; this may mean dearer food but since the quality will be far better this need not really mean an great increase in our outlay - especially if we grow some of our own, which some are already doing. I can see no reason why English Farmers do not return to local supplying, and use their land more wisely in some areas of the country - indeed, there is every reason to do so. An example of this is an English Farmer who stopped supplying the supermarkets with milk and started to produce cheese and butter of his own, supplying locals directly from the farm and through local markets - and it seemed to work for him. Stopping supplies to supermarkets means the abolition of mass-farming and a return to sanity. This has nothing to do with 'Animal Rights' which are as unreal as 'Human Rights' and merely a means to distort the truth. Animal welfare is not a 'right' given to animals, it is the duty and responsibility of every one of us humans, given the means to see what is right and what is wrong. Factory-farming of animals, battery hens, and the totally inhumane killing of animals by Kosher and Halal methods are things that must change here in England - they were never known to our Anglo-Saxon Ancestors. This goes for animal experiments of any kind, and for the treatment of animals as 'fashion accessories' which to them is unnatural (this seems to be because pets are now used to replace having children, and thus treated like children - which they are not!). The breeding of animals for 'show' such as done by Cruffs, whose ill-treatment in the breeding processes was shown up by the BBC recently. This is another matter of concern, since animals were bred for their work and as companions (pets or work) to man, but today they are bred (like Cruffs) for show or bred for profit (more widespread), or they are bought as 'pets' and then discarded when they get by the 'nice' puppy stage. Breeding for the 'looks' of a dog has meant dogs being produced who suffer for their whole life through the breeding process. This cannot in any way be seen as right. Man has always bred dogs, originally from the wolf, for working and as companions, and in some cases the breeding has caused problems, but never in the scale of today's breeding. It is also inhumane to breed working dogs and then discard them when their work is done - I do know of people who have had working dogs and kept them afterwards even when they cannot do their job, kept them and looked after them until the end of their lives. The working dog gives its all to us, and it deserves to be given our care and respect when its work is done. I do not like the idea of using animals to make money, like betting on racing and the like, but I do accept that this is an ancient thing and not a modern invention. Certainly, so long as the animals are not mistreated, they may indeed like racing around a track, and greyhounds, whippets etc. have been especially bred to race around and love doing so. The same goes for racehorses who most likely relish racing around since they have always been used by mankind for riding and working. Using dogs for hunting (for food) is a precarious subject nowadays, but those who promote 'animal welfare' and 'animal rights' are invariably those who suggest that all animals should be allowed to do what is natural. This being so, since these dogs have the wolf as their ancestor they are natural hunters since the wolf is a born pack-hunter. So if animals have the 'right' to live as naturally as possible then they would have to hunt! In any case hunting for food is another thing from hunting for sport. One of the things that 'animal welfare' and 'animal rights' do not consider is that man is also a part of Nature, and like animals we have a duty and responsibility to ensure a balanced and stable world, and this is done through killing as well as creating. The balance is held by each species acting within its own sphere, and not acting outside the Natural Law. Nature is not all sweet and light. The argument that humans are the only ones that kill for 'sport' is a fallacy, since some animals do exactly the same - cats will often play with a prey, even torture it before killing it. And there are species that hunt and kill for sport without eating their prey. Cruelty is all around us, and not just subject to human intervention - though we are no doubt the worst. If we lived in a Golden Age of Perfection things would be far different, but we do not live in such an age; indeed, we live in a Dark Age, the darkest age of the cycle, so we cannot act as if we do live in a Golden Age - if we did we would become like the Marxist Socialist Utopians who have caused the death of millions through their 'utopian ideas'. We have to live and act in this Dark Age, but as Men Against Time. Every Englishman should own his own piece of land here in our sacred land - England - One Man on One Acre. This cannot be done whilst profit and gain turns our homes into 'property' to be sold at will for a profit (and this is not restricted to large companies since more and more people are buying and selling for gain and getting on the 'property ladder'). 'An Englishman's home is his castle' was the saying, and every Englishman should have his own piece of land without mortgage debt. Yes, this would need safeguards, but since we are talking about a Tribal Society the land would be eked out through the tribe, given on the firm basis that the land is Odal-Land and passed on to the next generation within the Folk-Community. Where new land is needed for the next generation it would be eked out on the same basis, so that the land is owned by the Folk-Community and given to its members for their own use. The land would never be used for speculation and never leave the hands of the tribe, i.e. never sold off to outsiders or speculators. Every man and woman of the English Folk should be able to grow food and sustain their families from the land, or to undertake some skilled workmanship that benefits the community as a whole, and thus need a place to work from. In such a society the interests of the whole would come before the interests of the individual, and a new and healthy mental attitude must arise from such a change. Without the idea of an area being a 'tourist attraction' and thus outside the interests of those living in an area there would return a sense of being part of a Folk-Community, being an integral part of a whole. The attitude that the environment is there for man to exploit (an Old Testament concept) would fade away and be replaced by the need for the local community to look after its own area because it is in their own interests to do so. It would never be in its interest to harm the environment or harm life within that environment. The need for constant change (in an Age of Chaos) would be replaced by the need to maintain the environment around the Folk-Community. Owning one's own land, and returning to the hamlets, villages and small towns which are the heart of the Anglo-Saxon world, would mean a return to Nature and people working together with Nature, understanding Nature again - being one with Nature. Transport would be minimal with local food being produced locally and local goods produced locally. The need for 'tourism' would also be minimised since in times gone by only essential travel was necessary such as explorers or people travelling to gain knowledge - not 'holidays' which is again a rather strange concept since they have nothing to do with what is 'holy'. There is no reason why people cannot travel, but every reason to minimise this and stop the pollution of the planet. The shipment of live animals would also be a thing of the past since locally bred, grown and slaughtered animals would be produced for local people to eat. There would be minimal need for transporting food, and certainly not live animals which with today's technology can be slaughtered and moved just as easily. With people being within smaller communities, owning their own piece of land, and working that land, there would arise a new 'Nature Consciousness' and thus everyone would take part in looking after their own area, their own 'environment'. Life would become slower since there is no more rush for profits, everyone would have time to socialise and not be like they are today. The old English 'pub' could return as a meeting-point for social activities, as well as the local shops. And the old people would be far less isolated and alone as they are today - and a consciousness of Folk-Community (Blood-Kinship) would make everyone become aware of helping the old and infirm and making lives as best they can for their own parents. In today's world it is often forgotten (through the 'generation gap' created by the Great Liar) that parents give their lives for their children (or should do so) and should expect a return when they get old. Since supermarkets today can use the meat from such inhumane slaughter it would be wise to use local outlets for meat, and also for many other foods we use. Cost is the problem, but bought in bulk from a meat-supplier this can sometimes cost less than the supermarket. One of the illusions that we all no doubt have is that all supermarkets are cheaper; indeed this is not always the case. And bear in mind that the dazzling array of goods on the shelves sometimes encourages buying a lot more than we actually need! This is done deliberately as I am going to show. The slaughter of animals without stunning is barbaric and totally inhumane and this has no part of an Anglo-Saxon Society. Those who deny this are liars and deceivers. You only need to watch a human slaughter when the animal is stunned by an electric current and compare this with the animal who has its throat cut without stunning - this applies not only to Halal (which is usually attacked) but to kosher killing too. This is an alien concept an we should all seek to enlighten our Folk on this. Supermarket selling is designed to tell people what they want and not to sell people what they want. This cannot be denied and this concept, like advertising, was never a part of English life. Today advertising is everywhere and designed not to sell us what we need, but to tell us what we should have. This is all part of the mass-consumerism and mass-production of today's world, an idea that is totally destroying everything. It is perhaps not well known that supermarkets and large manufacturers used psychologists as a means to sell people their goods in mass. I became aware of this when reading a book written by a psychologist who started out by building his own business which was used by the Rowntree company some decades ago. This type of psychology was used to assess what people would buy, not what they would need to buy, but how they could be sold the product through careful packaging. It was the packaging that was important in the selling, not the product itself, which means that no concern for the consumer was ever envisaged - and this is decades ago, the process has no doubt been honed to perfection today. The 'Global' aspect of today's supermarket is obvious by the array of goods from around the world, all types of goods that have ultimately driven out our own English Tradition of food-consumption. This has certainly not been something for the better, since all we have today is shoddy mass-produced food that has little goodness and certainly has little health values. But the masses have been conned into thinking they are eating some kind of exotic foreign foods from all over the world - some scam! Many of you are not old enough to remember when the local butcher hung up his meat in the shop for all to see. This was not done for show, it was done to drain out the blood and allow the meat to mature. Today's packaged meat is dripping with its own blood which ensures that what we eat is tasteless and really worthless in terms of nourishment. The meat goes straight from the slaughter into the packet to the consumer and is not matured or drained. This is why the meat is a different colour than it is on the butcher's shelf. We are told not to wash chickens because this increases the chances of spreading harmful bacteria which tells us that battery-hens are actually filled with bacteria! And they know this! No properly bred chicken would be diseased but we are sold diseased goods through mass-production. Many of the goods containing meat but not being the whole meat-product and merely cast-off from the production of meat, the bits they cannot sell us so they make them into 'burgers' or other meat-contained goods. All in all we can safely say that supermarket goods and very often of inferior quality and although cheaper do not give the same nourishment as the goods bought directly from the farmer. This is no doubt not the case in every supermarket, nor the case for every farmer, for even in small outlets there are the odd rogue there to gain for himself. The great problem today is that many people are so used to eating the mass-produced food of the supermarket that they have actually forgotten (or never known) what real food tastes like. This is certainly true of battery hens which can be bought very cheaply but which are inferior in health-giving properties to a true free-range chicken. Chickens used to be full of Omega 3 but today they are full of fat. It is also a fact that food cut from the garden and eaten within a few hours is full of goodness, and loses its goodness the longer it is left to eat. Imagine what the vegetables are like when they have to be cut and then transported over the country, or even from foreign lands. An end to the 'Global Order' will bring us back to sanity and local growing and rearing. What I have said here can come about through a National Government coming to power, so long as that National Government is fully aware of the socialistic aspect of the New Order. At this time it is unlikely that such a government would come to power. The more likely scenario would be a total collapse of society coupled with catastrophic change which would break everything down into chaos, disorder and widespread destruction, from out of which would naturally arise a new form of Tribalism out of which again the Folk-Nation would arise organically. It is very likely that if changes started to happen oppressive laws would be brought in to halt these changes. This may also happen if too many farmers started to move away from the supermarkets into local production for local sales. We can see today how, when the Alternative Medicine scene started to grow there are more and more voices arising in opposition, not only ridicule (one method to stop people listening) but also in time no doubt through laws to protect the 'Drug-Industry'. And this is all in face of a National Health Service that is deteriorating rapidly. (*) Of course, this would be very hard to do with individual use of alternative medicine - Folk-Medicine. The System will have to tolerate some small alternatives, but when their whole consumer system is threatened there is no doubt they will act against any opposition. (*) There is an alternative 'Health Food Industry' but when closely considered this is no more than another arm of the Global Order, and in some cases sells alternative goods which are supplied from abroad in place of natural products that can be made here in England. These are things that need to be considered and it would be wise to consider them rather than dismiss them. At this present time, as individuals, there is much that we can do to change ourselves rather than wasting time on building 'pressure-groups' that are merely a stop-valve. When we have changed ourselves it will be time to preach to others! We need to lead by our own example in all aspects of life. This post was stirred from an article by Cliffe Dixon on the English Patriot site, an article about the recent flooding, especially the havoc wreaked in the North of England and Scottish Borders. The media (as usual) put this down to 'climate change' but he suggests a contributing factor that is very interesting. In this post I am not going to repeat all of what is said, for I wish rather to make comments upon the subject from another angle. He suggests a contributing factor was a European Union directive - the European Water Framework Directive (EWF) - which became law in 2000. This seems to have put an almost complete halt to the dredging of our rivers, according to the article, that is. To paraphrase the article it states that for all recorded history it was well known that a watercourse needed to be big enough to take any water that flowed into it, otherwise it would overflow its banks, thus flooding local land and houses. City authorities, and before them local manors, villages and towns organised themselves so that their watercourses were cleaned, deepened and where necessary embankments put into place, the latter usually by mounding up from the dredging. It would seem that the EU Law meant stopping dredging and embanking to allow rivers to 're-connect with their floodplains'. In other words allow the watercourses to flood land and houses - a move that only an idiot would take, but there seem to be plenty of these in Brussels! In order to ensure that this happens the obligation to dredge was shifted from the Environment Agency onto each individual landowner, but making sure that no funds were available for doing this. Also any sand and gravel that is removed was reclassified as 'hazardous waste' and could not be used to raise the banks, but had to be taken away for dumping. This situation is typical of the people who run the world today, an act of complete lunacy! The underlying cause is that the EU, as many other bodies, is run by the type of Liberal-Left Green whose aim is to create a completely fictional 'Socialist Paradise' in which everything is perfect. This mentality has permeated all walks of life, and their actions have completely the opposite effect - disorder and chaos. The same type of people have allowed millions of 'refugees' into Europe and created disorder and chaos, a rampant rise in crime, and untold problems in housing, health, and many other areas affected by this move - one of them being allowing terrorists into our midst! We already know what this is like here in England since we have had the problem for decades. The argument that rivers should run their own course without interference can in no way be said to be valid when land, homes animals and humans are at risk of the rising waters - so much for their 'animal welfare'. Yes, there have been grave errors in planning where houses have been built upon flood plains, but they are still doing so now, and merely because of an influx of new people into this country - which is their doing, not ours. This is also because planners have no where near the knowledge of the ancients who understood and worked with Nature. Another problem is that the same people who choose to think this way seem to think that our environment is 'natural' but this too is a falsehood since for thousands of years man has shaped the environment to his needs - so most of what we see as 'natural' is actually man-made. This also goes for watercourses which have been altered for thousands of years, so the idea that this should not be done because they need to run their 'natural' course is once again a falsehood. True, in ancient times man worked with Nature and shaped according to Natural Law, which is contrasted today where profit and a quick gain come before any thought of Nature. One of the problems for the EU 'Greens' seems to be that some rare crayfish or freshwater mussel may be washed away by fast-flowing waters. The introduction of US Crayfish into the River Kennet has almost wiped out the English version, but this does not seem to be a problem - i.e. the introduction of foreign species into a land, including (of course) species of man, which is a move proven to disrupt the eco-balance of Nature. Anyway, since when have any of these people been near a mollusc or invertebrate bar from the supermarket stuff they may eat! When we consider their actions, and prior to this the thoughts and ideas that must have come into their heads, they seem to pick up on some illogical idea and put it into force even though the consequences are catastrophic. Maybe this is not too hard to believe in view of the fact that this is exactly what the Communist Regimes have always done. Is it not true to say that Communism or International Socialism has always worked with ideas, and always looked to a utopia, and then put into practice these ideas resulting in the loss of untold millions of human lives and endless suffering wherever their ideas have taken hold? What the EU is doing is nothing less than putting into practice the utopian ideology of the Communists. We can see the type of people involved in the 'leftist' Greens (not all 'Greens' are on the left) when we see the leaders of the Green Party in Brighton on the forefront of the anarchic aims to stop the yearly 'March for England' (*) parade with the violence of the 'Rent-a-Mob'. Indeed, it is in the cities that the Green Party has its main hold, and Brighton is at the forefront - as well as at the forefront of degeneracy! Not so much of a great legacy to leave, is it. (*) The 'March for England' parade was a patriotic march that included women and children at the beginning, women and children that were subjected to the violence of the Rent-a-Mob when these people decided to 'Stop the March'. This was not a 'fascist' or 'neo-nazi' march but a march for the English people, but the reaction by the violent anarchists and communists must surely now have sunk into the heads of these 'patriots' - it does not matter who you are, if you support our own people you will be attacked! Again and again this is being driven into groups who wish to remain 'populist' and the message must surely sink in one day - you can only fight like with like! The answer to all of this is to return to a form of Tribal Consciousness within the Folk-Nation; local issues, such as rivers and other watercourses, should be tackled at a local level. Without some idiot classifying dredged waste as 'hazardous waste' (the only 'hazard' may be in the pollution in the mud and stones caused by their society) local groups could tackle these issues at source, knowing full well of the problems (being local and not over in Brussels) that would occur. This is just one subject but there are numerous subjects we could look at with the very same problem. We have a very good system of Shires which have been with us since the first English Folk settled here; these are local regions that should be allowed to work on their own initiative in regard to local issues. Breaking England into a smaller number of larger 'regions' will do nothing at all to solve this, especially when they are ruled from Brussels. The local Shires are the backbone of our Folk-Nation and the importance of recreating small regions again cannot be overestimated. These, of course, must be based upon natural boundaries and not politically-motivated boundaries changed over and over again to suit individual parties who do so to gain more 'votes'. Finally, this would also seem to be yet another example of the modern 'progressive society' which takes everything from the past, all of the accumulated knowledge of centuries or even thousands of year, throws it out of the window and goes on to come up with new 'ideas' that only a complete idiot would think up. Where these 'new ideas' do have some foundation they can be traced back into the past but have been 'reinvented' using some new-fangled modern term (usually some Greco-Latin term that no-one understands, which is why this is done) for them to make it look as if these people have come up with the ideas. Son of Hengest and Horsa - the Divine Twins. England - won by the sword, worked by the plough. And cherish it for those to come. This sacred land - this England! Beware! There are Wolves Amongst The Sheep! This was a poem-rite used at one of our activities at Battle Abbey in East Sussex, where on numerous occasions we not only gave honour to our English forebears, but protested against the anti-English bias of the '1066 celebrations'. Proves the worth of Aryan Power. Right to the end defiance ran. To match their might, ne'er running scared. His life a war against all odds. 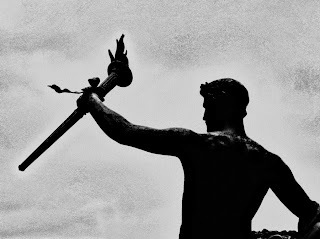 For victory one day we'll gain. For one who comes at break of day. Hail now to you - the Conquering Son. Now rise The Hallowed One again. Rides forth before the victory won. The Armies of the Beast they face. That victory this time we gain. A cleaner Earth the Sun shines on. 'We must secure the existence of our people, and a future for White Children'. Today we need to cultivate a brand new attitude amongst ourselves, and more importantly, a brand new self-discipline. The age of mere 'street-fighters' has gone! We need the 'Cultured Thug' who does not need to be fueled by alcohol (*), but who has a disciplined attitude to fighting against all odds; this means creating the Warrior of Woden who is self-disciplined, trained in self-defence and the Combat Arts, and also trained in the Esoteric Warriors Arts, able to keep the Calm Centre and act intuitively at all times. This has always been the aim of the Ar-Kan Rune-Lag and during 2016 this will become even more important. (*) There is a time for alcohol and our Ancestors drank mead and ale with each other in the Mead-Halls, but we need to consider that when building a Security Force we need to recruit and train a disciplined, trained and ordered force which can counter the anarchistic, drug-infested, alcohol-infused 'Rent-a-Mob' that has always been used against those who oppose the Old Order. When we carefully study these types it is the mass that is used against the few which is a blatant act of cowardice on their part, but the only way these people can counter the Eternal Truth. Our Folk-Moots are different, a place to socialise and enjoy our own company in a world opposed to our ideals, but we still need to consider this in view of security. The 'soldier' has a career and is paid to fight, whereas the 'warrior' fights for an ideal and an ideology. Not all 'soldiers' are 'warriors' and not all 'warriors' are soldiers'. The 'soldier' can be a 'warrior' but this is not always so, since the soldier does as he is ordered, and sometimes fights against his ideals (sometimes due to his loyalty to his nation). War today means that more and more people are on the 'front-line' which has become a reality starting with World War II when civilians were subject to bombing, and today with the 'War of Terror'. We have many soldiers and ex-soldiers amongst our ranks but they are first and foremost warriors since they uphold our Noble Cause. We respect their courage and their warrior-hood because we see them as 'warriors' who fight for our ideals. These people are trained to fight and this is something that we need within a Folkish Movement, and many of them are also trained in Survival and the Martial Arts. (*) Significantly, he told me he was treated much better by the Germans who we are made to believe were the 'evil' ones of World War II. 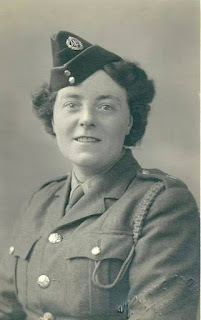 He also told me about how the Germans 'paid' (with extra supplies) the British POW's to work (thus not breaking International Laws) on railways bombed by allied air strikes, railways that supplied these POW Camps. Someone wanted to make things worse than they were! The Warrior of Woden is a new concept, a new ideal of the New Age, of the Age of Ingwe. This is the aim of our Folkish Movement into the future. This has been taken up by forward-thinking movements and is a sign of the resurrection of the Noble Aryan Ideals that will come into fruition in the New Age. What is needed is the self-discipline of the soldier fused with the idealism of the Holy Warrior. What we do not need today is the drunken brawler of the past that only added fuel to the smears aimed at any movement that opposed the New World Order. This was epitomised by the EDL at one time, but has been the bane of many other nationalist organisations. Leave this to the anarchists of the Left whose only aim is to break down any authority and destroy everything in their path. Only an organised and disciplined movement will be able to counter and overcome this type of opposition. Many of the older people who have been in this struggle for many years may have been part of this, and I myself am no exception, but we need to put this behind us and give a new impetus to the youth who are the future, and whose ways must be different from the past. We need a New Noble Man - the Warrior of Woden - who combines intellect & intuition as well as courage & physical strength. This is the 'Cultured Thug' of Byron which Jonothan Bowden so rightly sought to revive - The New Barbarian. HAIL TO THE GLORIOUS DEAD! HAIL TO THE VICTORIOUS DEAD! We struggle against the Forces of Darkness and Matter not only for those who have gone but for those who bear our genes, and for those who are to come in the future. This is an Eternal Struggle and we shall never give in. No Surrender to the Forces of Darkness and Evil! Light will triumph! For the Man-to-Come. This I feel refers to the planet Venus which appears in the morning at certain times of the year 'clothed with the Sun' (the rising sun) and the crescent moon 'under her feet' (i.e. below the planet). The 'Crown of Twelve Stars' is the constellation known as The Corona ('The Crown') which stands near to Venus at this time. In the text of Revelation Venus brings forth a 'man-child' who was to 'rule the nations with a rod of iron', which refers to the 'nations' or 'Gentiles'. Now, it is also said that a 'great red dragon having seven heads and ten horns and seven crowns' appears as another 'wonder in heaven', and this beast would 'devour' the child. It is well known in both the story of Jesus and of Krishna that the evil force tries to prevent the birth of an avatar through the slaying of the children, or 'Slaughter of the Innocents', which seems to be part of the same archetypal myth. This should be noted since it is an important point. This being so then 1260 days is very near to three and a half years - a year ('a time'), plus two years ('and times'), plus six months ('half a time'). If this is right then she is in the 'wilderness' for three and a half years, which may also be symbolic of the three and a half coils of the Fire-Serpent (Kundalini). 'Woe to the inhabitants of the Earth and of the sea! for the devil (Evil One) is come down unto you, having great wrath, because he knoweth that he has but a sort time'. This is an important text because it suggests that what we are seeing today, an increase in oppression world-wide which seems to be done out of desperation, and the hastening of the destruction of the White Folk around the world, is going on because the Dark Forces recognise that their time is up and a new power and force for good is arising. No doubt that some of this is due to their complacency in feeling that nothing on earth can oppose their power, but subconsciously things may be different. They may hold total control over the masses, yet the masses have never changed anything, change coming through the will of the few. There are also meta-genetic factors that these people have overlooked. This text also implies that there was a war on the Spiritual Planes, a war in which this Evil Force was defeated, and thus was cast out 'onto the Earth' where the Final Battle would take place. This makes sense of everything we know of the history of the past 100 years, since defeat on the physical plane does not imply defeat on the spiritual plane - hence the reason for optimism rather than wallowing in a so-called 'defeat'. The power of this Evil Force has certainly accelerated since the end of World War II. It now has total control over this world, and hence it's final defeat must happen here on the material plane. To return to the 'woman' who is Venus or Freya. We are then told how the Serpent 'cast out of his mouth water as a flood, after the woman, that he might cause her to be carried away of the flood'. Here the Earth helped the woman by opening up and swallowing the waters. This incensed the Red Dragon which '...went to make war with the remnant of her seed...' Now, we can see here that the Red Dragon's aim is the destruction of the Seed of Freya which we can equate with the Fryans or Frisians (Folk of Freya). At this point we should perhaps consider the floods that we have had over the past few years and not dismiss these as a coincidence. We may see these as a natural phenomena, but this is a subject for debate since we do know of ancient tales of the Druids being able to change the weather, and we also know that these Dark Forces study ancient texts with the aim of the control of Nature ( as does modern science). If we are to believe certain sections of the Oera Linda Book (which is an 'Initiated Work' and not a historical document) then the Folk of Frya were far more numerous that what we know as the later 'Frisians', and would have been scattered over various areas after the catastrophes that beset their lands (At-al-land) in previous eras. Indeed, these people would have formed part of the Ingwaeones that Tacitus mentions, and would thus be connected to Ingwe (Frey) as well as Freya. The coming together of the 'Friends of Ing' or the 'Sons of Ing' created the Nation of Ingwe - the English Folk. The 'Jesus Christ' of the text of Revelation is actually said to be the 'root and the offspring of David and the bright and Morning Star' which connects the Krist to the Morning Star (Venus) and thus to the Waene (Vanir), and thus to Ingwe of the Waene, as well as Freya. I have already mentioned in various other sources how Ingwe (Frey) and Freya are both man and wife and brother and sister, and that Venus is a Double-Star which is both male and female, and connected to both Ingwe-Frey and Freya. There is also an obvious link between Venus and Bootes. In certain Gnostic Kristian texts the Krist is sent by Sophia, whose name means 'wisdom' and who gives us the word 'philosophy' ('philosophy' means 'love of wisdom'), to right the wrong done by the Demiurge (Jehovah) by sending down The Krist to aid mankind. Whatever the case Sophia must thus be our own Freya who sends her 'son' to aid us in our struggle for survival and the defeat of the Demiurge. It is also important to note that knowledge, and thus wisdom and above all understanding is the key to this struggle since it is waged against the Forces of Darkness and Ignorance, the forces that seek to keep mankind in the darkness, unaware that through the Tree of Knowledge and then the Tree of Life mankind may become as 'gods' - Divine Immortals. In this text 'The Beast' is given power by the Great Red Dragon, and when we see 'The Beast' as the European Union this fits in with what has happened over the past few decades. Since this power becomes world-wide, as it is said that - 'power was given him over all kindreds, and tongues and nations' - then this is the 'New World Order'. There is a strange statement in Revelation which tells us that the 'First Beast' was 'wounded to death' but was healed and 'all the world wondered after the Beast'. Then we are told that 'another beast cometh up out of the earth... and he exercised all the power of the beast before him'. The first beast had 'the wound by a sword' which suggests that this Evil Force had a setback and was 'wounded' but came back in the form of yet another 'beast' after the first was wounded by a sword. The Hebrew letter ZAIN means 'Sword' and is an anagram of NAZI! It is this second beast that brings into being the 'Mark of the Beast' - the 666 Mark coming into being when the 'Cashless Society' comes into being. We do actually find that the whole world (bar the few) have been deluded by this Evil Power, as suggested in these texts, and that this power was 'worshipped' by the masses (which is the case today) - certainly the people of the Earth have been 'deceived' by this power, and few feel that it can be defeated - which it will be! The number 666 seems to be related to the material and physical world, but the number 144,000 seems to be related to the spiritual realms. The 'Fall of Babylon' is perhaps symbolic of the fall of the New World Order, and in particular the fall of the Brit-American Empire of The Beast which today seems to be the controlling force (with the Red Dragon powering this force). It was 'with violence' that this 'Babylon' would fall, and 'in one hour so great riches is come to nought'. After this the time of the return of the Krist-Spirit takes place, the Coming of the Son of Man with the Armies of Light, riding a White Horse, and wielding a 'sharp sword' in his mouth ('Word-Sword'). This is hardly the figure of a meek and mild 'preacher' but the figure of Kalki Avatar, HelgiH or Wid-Ar the Avenger - The Hooded Man. When we consider what I have said here the importance of Ingwe-Frey and Freya comes to the fore. What this post is about is not the Jesus Christ of Saul/Paul but the true and original Cosmic Krist who we are told in Norse Lore 'shaped the world' (under the Hagal-Rune). Krist = Lucifer ('Light-Bearer', Venus) = Woden = Wid-Ar (Woden resurrected) = Ingwe ('Son of Man'). These are archetypal figures taking part in an archetypal myth. The importance of bringing these Mysteries of Krist (Ingwe) into the light is that they can be used in argument with Christians who have for so long been bound by Judaeo-Christian dogma. This negates the criticism that will no doubt be raised against me for using 'Christian' works, even though the ideas given here are plain to see, and thus give hints that these works are not quite what they seem. Indeed, they fit in well with Germanic Mythology and with Hindu Mythology, and the other Aryan Mythologies that have similar ideas. In regard to the Krist being the 'root and offspring of David' we can find a very strange thing in the biblical texts, for the son of David is Solomon, famed for his great wisdom, and also his great foolishness. In esoteric symbolism the 'Star of Solomon' is a five-pointed star, which has been used in ancient times as the Star of Venus (*). And yet his father, David, has today for his symbol the 'Star of David', a six-pointed star, this being related to Saturn and not to Venus. Indeed, this seems to have been a very late symbolism used by the Rothschild Dynasty as the 'Star of Israel' - i.e. Zionism (or its previous forms). Maybe this is why the New Testament 'Christ' referred to the 'Synagogue of Satan (Saturn), which say they are Jews, and are not, but do lie..' (Revelation 3:9). This again suggests a distortion from the truth. (*) This is also found in Norse Mythology where the Wolsunga Royal House is threatened with extinction when Rerir is childless in old age. This Divine Race and Offspring of Woden is saved through the intervention of 'Venus' (Freya) whose handmaid drops an apple into the lap of the wife of Rerir who then bears them a son - Wolsung. It is important to note that not only is the apple symbolic of immortality but also of renewal; when cut in half along the central axis, cutting it into two halves with the 'poles' being intact at each end, a five-pointed star is seen at the core. Indeed, within this five-pointed star are the 'pips' - i.e. the Seeds of Renewal (anyone can test this themselves). Here, indeed, we have confirmation that Idunn is actually another name for Freya - Venus. It is Idunn that saves the Wolsunga Royal House - the Divine Race of Woden. Through Siegmund, Sigurd and then Parsifal the Wolsunga Lineage plays the leading role in the struggle against the Dark Forces and the final overthrowing of these forces. It is Venus-Freya-Idunn that will bear the Last Avatar who will achieve the Final Victory - the End-Sieg! It was Woden himself that sired this Divine Race in order to combat and finally defeat the Joten. What I have said here suggests that the Wolsunga Lineage is in fact the Graal Lineage. The five-pointed star as the 'Star of Venus' is used today within 'Wicca', which is a distorted version of 'paganism'; this is shown clearly in that 'Wicca' pursues a Lunar Religion which runs counter to the five-pointed star symbolism, which has thus been distorted through its wrongful use. In masonic symbolism, probably from the Egyptian symbolism, the five-pointed star and a (rounded) Wyn-Rune is used as a glyph of Venus. This is indeed, for once, correct (and perhaps lost to modern Masonry), since the Wyn-Rune is the Rune of Venus and the Waene. Both the five-pointed star and the Wyn-Rune are symbolic of Freya-Venus. Since the five-pointed star was linked to the handmaid of Freya (Venus) this may well be her symbol; we may thus surmise that the other symbol - the Wyn-Rune - is linked to Ingwe (Frey) in some way. This is just a thought at this time, but one that needs consideration. Since 'Wicca' is an Old English word, and the main body of this organisation worships a 'Lord and Lady' (as well as just 'The Goddess' which is a feminist slant), they represent a modern distortion of the worship of Frey (Lord) and Freya (Lady). Here, once again, we can see how these Dark Forces create nothing, they merely alter what is into something unnatural - or put another way they 'create' a mockery of what is natural. Maybe this is why they use an Old English term for a movement that has nothing to do with the English and is based upon either distorted 'Celtic' ideas or a strange mixture of various traditions. The five-pointed star is thus symbolic of our goddess Freya-Idunn and maybe as the Goddess of Dawn, of Ostara-Eastra. A title that crops up in Anglo-Saxon texts is that of the Wunsc-Frey or 'Wish-Lord' and this has to be linked to the 'Wish-Hounds' that are part of the Myth of the Wild Huntsman. I have shown in other posts how Ingwe would appear to be an early form of Woden as a 'One-Eyed God'. This is not out of the question since their roles in later times overlap - Woden is also linked to fertility through the Ride of the Wild Army. The term wunsc is related to the Wyn-Rune which is a Rune of the Wild Hunter-God (Woden or Wyn/Gwyn/Wydion/Gwydion). Idunn, of course, may well be the equivalent of Danu who is the Goddess that brought into being the Tuatha de Danaan - the Tribe of Danu. If so then the Folk of Freya and the Folk of Danu are one and the same in ancient times. There may also be hints that Danu was not a goddess restricted to Ireland, since in Leicester we find an area known as the 'Dane Hills', named not after the Danes but of a dark figure known as Black Annis. Since this was corrupted to 'Dane' then the original may have been 'Danu'. We should remember that the title 'Frey' is just that, a title; and that the title 'Freya' is also just that, a title. They are not names as such, and the English used the true name of this god and divine ancestor - Ingwe. It is thus right to use the term Idunn or Ostara for this goddess, these being the same Goddess of the Dawn. This is the Dawn-Star as opposed to Ingwe who is the Evening Star, though they may both have their roles reversed. The name 'Ostara' is also a title when we consider its meaning - 'Star of the East'. 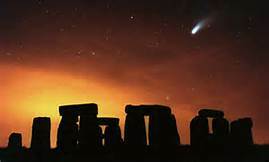 Either as the Morning Star or the Evening Star the English may have seen Venus as Earendel; this is Ur-Waendel connected to the Long Man of Wilmington. It may well be that this is the Evenstar of Tolkien, whose Divine Light shines in times of peril and danger. This is connected to the Ear-Rune (The Eagle - see above where the 'woman' is given the wings of an Eagle) and the Cweorth-Rune. Here we have the paradox where the Long Man represents the New Dawn and heralds the New Age. Venus is the 'sister-planet' to the Earth and if I am correct revolves in the opposite direction to our planet. A complex web begins to unfold with these ideas, a web that needs far more thought to enfold in all its glory. What we need to consider with these ideas is that whenever an idea comes into play its opposite must arise naturally, and thus we find certain paradoxes that seem at first sight to make no sense. The Herne Giant is the figure of the Hunter-God, the God of the Winter aspect in the West, yet to the east of the Long Man is 'Hunter's Burgh' so this figure has similar qualities, but it is the Summer aspect in the East. Its time is of the balance of Light and Darkness at the Dawn and the Dusk, yet it also represents Cygnus the Swan which is a Summer Constellation (August-September). It is the Golden Dragon (Spring-Dawn), the White Dragon (Summer) and the Red Dragon (Autumn-Dusk) all in one.